Shakespeare fans can experience three different productions of the Bard’s work live in Ormskirk this month, at The Arts Centre, Edge Hill University. The drama starts on the evening of Wednesday 18th July with a Live Theatre Screening of Romeo & Juliet from RSC Live. Set in a world very like our own, this Romeo & Juliet is about a generation of young people born into violence and ripped apart by the bitter divisions of their parents. Saturday 21st July brings both matinee and evening performances of A Midsummer Night’s Dream from the Arts Centre’s own Rose Youth Theatre. Preparations are under way for the high-profile wedding of Theseus, Duke of Athens, and his bride the Warrior Queen Hippolyta, but the wedding planner Sebastian finds that he has more problems with the guests than the happy couple… including a rift in the underworld, in-fighting among the entertainers, and a mischievous sprite to contend with. The Rose Youth Theatre senior members present a fun-loving, modern English version of A Midsummer Night’s Dream by Geoff Bamber featuring a few musical twists with some hilarious moments. This new generation performance is based on the classical Shakespearean play with all the much loved characters but with a fresh, contemporary approach. 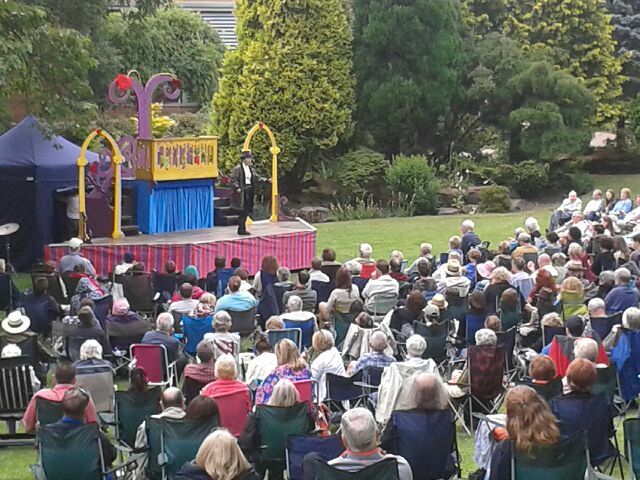 The afternoon of Sunday 22nd July brings the annual Open Air Theatre performance in Edge Hill’s beautiful Rock Garden from Illyria, this year presenting The Merchant of Venice. The Merchant of Venice is a funny play that deals with serious issues – in particular the keeping of promises. Wealthy Antonio borrows money from Shylock, and both are so confident about his paying it back that they jokingly adopt a ridiculous agreement: that Antonio will give Shylock a pound of his flesh should he default. Then events conspire against him so that he cannot repay the loan. Meanwhile Bassanio risks everything in the hope of winning the hand of Portia in marriage. Admittedly he succeeds – but when she gives him a ring to keep, and he is compelled to give it away, what future for their domestic bliss?